Maybe you're like me this year, and having a harder time than usual getting into the Halloween spirit. Generally, by the time of the "GREAT NIGHT OF CANDY", I've already made all sorts of cutesy, spooky, devilish little treats--this year, not one is sitting on my counter. Maybe it's because my husband is recovering from hip surgery and so much better now that he's starting to feel antsy that he can't run in the NYC marathon this coming weekend and has kept me busy keeping him entertained. Or perhaps my lack of Halloween enthusiasm is due to the fact that I'm juggling three projects right now and feel like a chicken walking around without its head. And add to that, the general rushing around for hockey and soccer and the fact that my kids are well past the trick or treat stage. 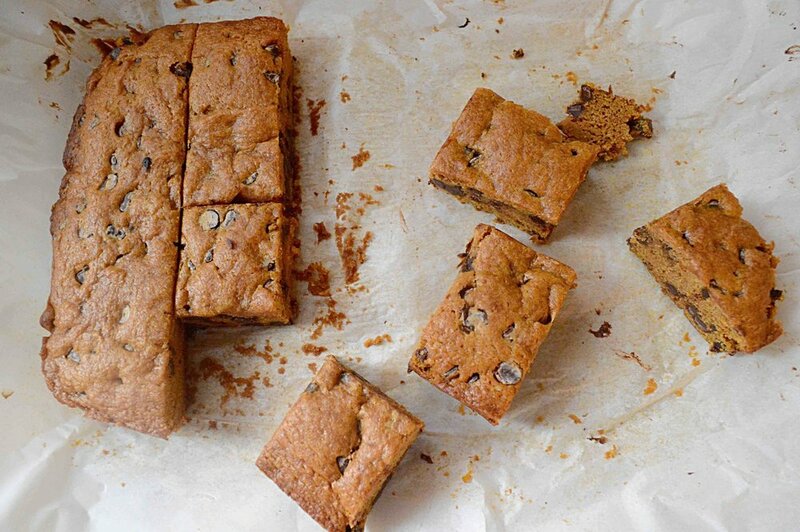 Whatever the case (and thanks for letting me vent a bit), if you're feeling not so Halloween-ish too, but still want to do something a little bit special, these Pumpkin Chocolate Chip Blondies are right up your alley. And just in time for the big night!! Brownies and blondies are some of my favorite desserts and these will not disappoint, I promise you. They're full of the goodness of pumpkin and cinnamon, a little bit dense, a little bit chewy and then of course--there are chocolate chips--lots of them--so what could be better than that?! They're everything you'd want a Halloween brownie to be, sans too much cuteness. And they're easy to make, which means you could even whip these up today in time for tonight (conversely, you could save them for Thanksgiving--they'd be a great addition there too! Or make them for both holidays or for no reason at all. I don't think you'll find anyone complaining!!) So have a safe and happy Halloween night--me, I'm looking forward to at least one Snickers!! 1. Preheat oven to 350ºF. Spray a 9x13-inch baking dish with non-stick cooking spray and line with parchment paper. Set aside. 2. Sift the flour, cinnamon, baking soda and salt into a bowl and set aside. 3. Using an electric mixer, cream the butter on medium speed. Add the sugar and beat until light and fluffy. Add the egg, pumpkin and vanilla and beat well, scraping down the bowl as needed. Don't worry if the mixture looks curdled. It's ok.
4. On low speed, gradually add the flour mixture and mix until just combined. Scrape down the bowl to make sure that there is no flour on the bottom of the bowl. Then remove from the mixer and use a rubber spatula to fold in the chips. Scoop out the batter into the prepared pan and smooth the top with the back of a spoon or an offset spatula--the mixture will be pretty thick. 5. Bake for 35-40 minutes, until a tester comes out clean. Place the pan on a cooling rack and let cool fully before cutting. Use the parchment paper ends to help remove the blondie slab and transfer it to a cutting board. Cut into 24 bars. Bars can be stored in an airtight container at room temperature for up to 5 days. Note: Recipe adapted from Butter Baked Goods by Rosie Daykin. I subbed in 1 tablespoon of cinnamon for the 2 tablespoons pumpkin pie spice since we're not big fans of that around here.